Fairfield's Jarred Hahn, left, and Master KJ celebrate Hahn's eighth-place finish at the Junior Olympics. For Fairfield native Jarred Hahn, Taekwondo was not always natural. In fact, there was a time when he did not even know what the sport was. However, those days have long since passed as the 13-year-old Roger Ludlowe Middle Schooler, Hahn, competed at the Junior Olympics in the 12-13, 90-99 pound, red belt sparring division, finishing in the top-eight in the country in Orlando, Fla. at the USA Taekwondo Nationals and Junior Olympics July 1. Taekwondo on the Post Road in Fairfield. Hahn found World Championship through a fluke trip to Joe's American Bar and Grill. "I was waiting with my mom to get a table and saw the lights across the way," Hahn said. "I asked if we could stop in." The rest has been history. 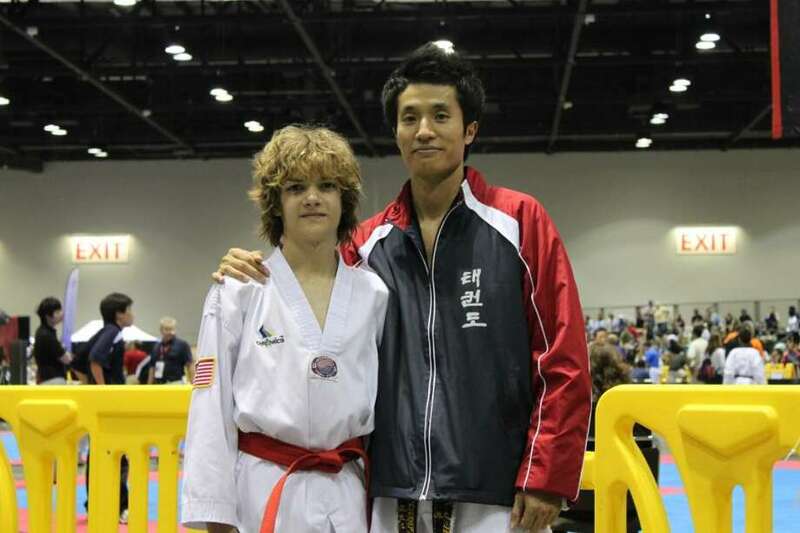 Hahn has been one of the best competitors that the karate club has known. "He was the first to reach the Junior Olympics from World Championship Taekwondo," Master KJ said. "He is a great role model and is very respectful to the other students." "I tried it out and it just took off once I started," Hahn said. Hahn has competed in various states and regional sparring competitions over his four-year membership at World Championship. He qualified for the Junior National Olympics in 2009, but Master KJ held him back because he was not ready. "He was not ready to compete at that level," Master KJ said. "That experience prepared me for what I would be going against [this year]," Hahn said. This year, he trained all year for the opportunity to get to Orlando. It was no small feat for Hahn either as he had to finish first at the New York qualifier. He did just that to earn a trip to Nationals. While at Nationals, Hahn felt nerves and anxiety, but that quickly subsided as he was immersed into the competition. He won his first match in Florida, but fell in his second match against eventual third-place finisher Marco Garcia. For Hahn, a first trip to the National Championships was a terrific experience, and he said he now knows what to expect at a large venue with many spectators and followers. "I was nervous going in," he said. "But now I know what to expect and know what I can expect from the competition and myself." Hahn's younger brother Davin has started competing under the watch of Master KJ. Davin will begin training as well and try to compete in a state tournament next year. But Jarred admits that his younger brother is just a smaller version of him. "He's like mini-me," Hahn joked. "He needs to grow physically a little." Hahn wants to improve on his sparring result, but also would like to qualify for the Junior Olympics in the other two Taekwondo events, weapons and breaking. "I'd like to finish first at Junior Olympics," he said. Hahn and Master KJ will have ample opportunity to get better as World Championship is moving into a 3,000-square-foot building on Mill Plain Road. It will be a bigger and nicer complex, especially since Hahn spends a lot of his time there. He is at World Championship four to five days per week, and competes in about three tournaments per year. and working on his strategy is the most important thing. "I want to advance further and progress more positively," Hahn said. "I have to work on my combos some more." Master KJ believes that the sky is the limit for this outstanding kid and athlete. "He has good speed and power," Master KJ said. "With more experience he could finish much better."